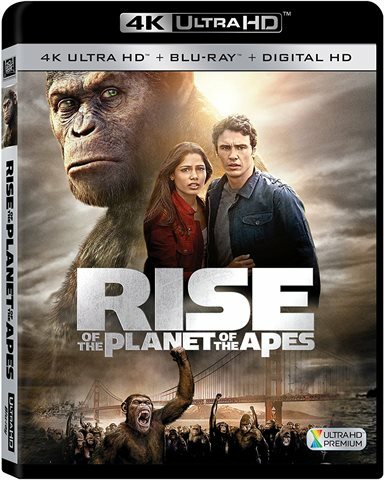 The 4K offers a unique viewing experience that, in this case, is well worth it and any Planet of the Apes fan will not only want to get this combo pack but its sequel, Dawn of the Planet of the Apes, as well. In 1968, a film debuted about a planet where human-like apes ruled and humans were mute prisoners. The foreign concept captured the imaginations of millions of people and became a popular series spawning 4 more movies through 1973. Then, in 1974, a television series aired but only lasted for one season of 13 episodes and for a time the apes were put to rest, until 2011 when Rise of the Planet of the Apes graced the big screen and delighted audiences once again. Will Rodman (James Franco; 127 Hours) is a scientist working on a new drug in hopes to cure Alzheimer's disease. He is excited when he believes he has made a great breakthrough but when one of his "subjects", an ape he names Bright Eyes, goes berserk and hurts members of the lab the testing stops. Subsequently, all the subjects are put down but Rodman discovers Bright Eyes became violent only because she was protecting her newborn. With no one else to help, Rodman takes the ape, which he names Caesar (Andy Serkis; Lord of the Rings: Fellowship of the Ring) home. Over time, it becomes apparent Caesar has the experimental drug in his system as he shows advanced signs of intelligence. However, as Caesar grows, he is harder to control and hide. When he harms Rodman's neighbor while defending Rodman's father (John Lithgow; 3rd Rock from the Sun) who suffers from Alzheimer's disease, Rodman is forced by the courts to leave Caesar at an ape sanctuary. While Rodman does what he can to get Caesar out, Caesar, tired of the poor treatment he and the other apes face, coordinates an uprising that ultimately ends with the apes, including Caesar, escaping and leaving to live in the forest. The plot of this film gives the audience insight into what created the intelligent apes and how they became to be their own "colony". For those of us old enough to remember the films/television show, having a "backstory" of who and what made these unique creatures is quite interesting. However, since the original movies were set on a different planet, the plots don't completely match up but the story is interesting enough anyway. Even though I'm not a James Franco fan, I enjoyed his performance in this film. He offers a range of emotion typical of a man who watches his "child" being taken from him. John Lithgow also offers a subtle performance as an Alzheimer's patient who suffers waves of coherency followed by confusion. However, the star of this movie is clearly Andy Serkis as he shows off his motion capture expertise as Caesar. Creating complex facial expressions while jumping around like an ape adds another level to an actor's performance and he pulls it off beautifully. The 4k disc's 2160p resolution with a 2.35:1 aspect ratio and HEVC Codec accentuates the excellent work done by the CGI team. The apes look very realistic down to every piece of fur on them. There are only a few moments where the graphics look fake such as at the end when Caesar is at the top of a redwood tree looking out over the Bay. The background looks terrible at that moment but there are so many other great scenes that make up for it. The DTS-HD Master audio 5.1 is strong and sharp but it is interesting that it wasn't converted to Dolby Atmos for the 4K edition. While the Blu-ray disc offers a number of extras some are not supported by the 4K player. However, there are several extras to enjoy including: Audio commentaries, deleted scenes, Mythology of the Apes, The Genius of Andy Serkis, and a new generation of Apes. Most features offer some interesting insight and details but the best for me was watching Serkis work.